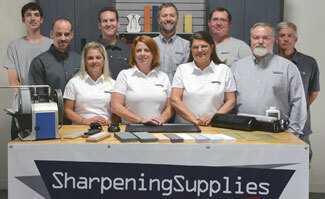 At Sharpening Supplies, we test the products we sell. By testing our sharpeners, we can provide recommendations based on actual hands on experience, and not just the product specifications. This chart was designed to help you select the best Chef's Choice electric knive sharpener for your needs. Compare the four sharpeners based on the features available. Size 9.5"x4"x4" 9.5"x4"x4" 8.5"x4"x4" 9.5"x4"x4"
Manufacturing Source U.S.A. U.S.A. U.S.A. U.S.A. Questions about the Chef's Choice Electric Knife Sharpeners?